1. 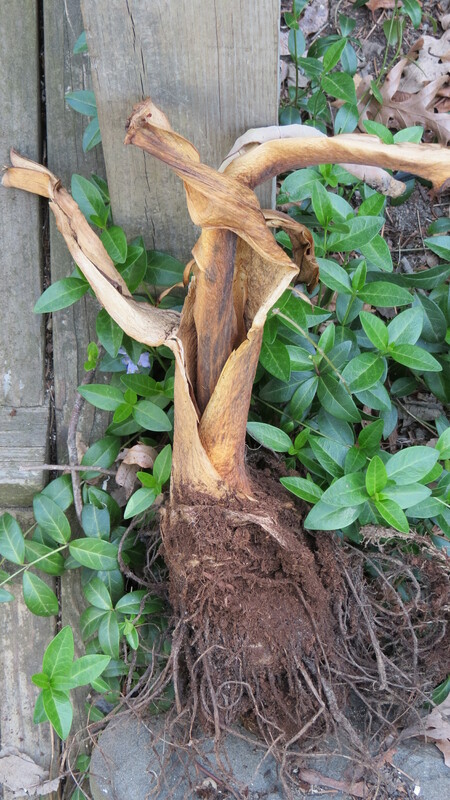 After a long winter’s nap, the stems, leaf remnants, and roots have withered from tropical green to paper bag brown. 2. To clean each bulb, I shake off the excess peat moss and dirt. 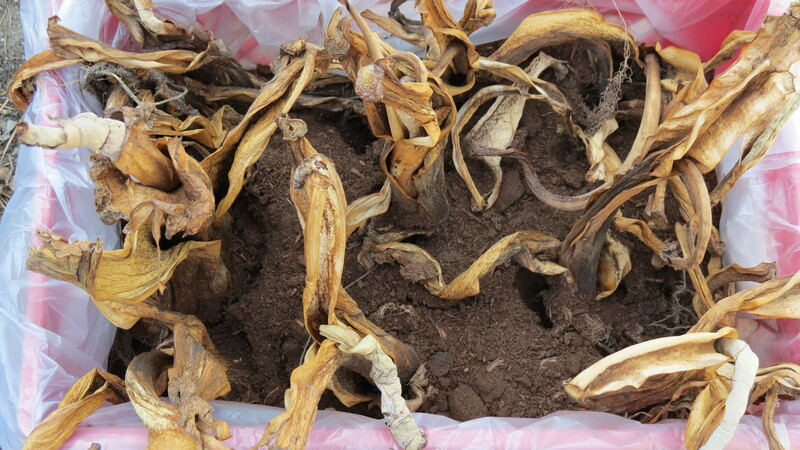 Then, it’s time to husk the dead leaves, stems, and roots. 3. It takes a little effort, but once cleaned, there is usually a pinkish shoot at the heart of all that brown – the promise of new growth. 4. 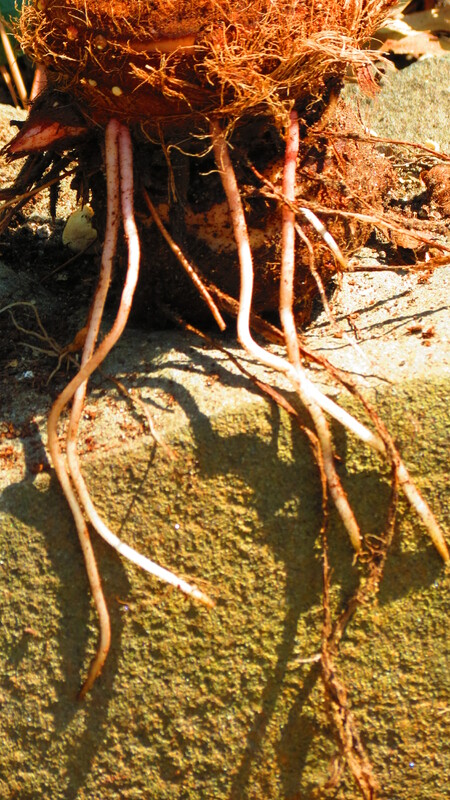 Some bulbs may still have healthy looking roots. 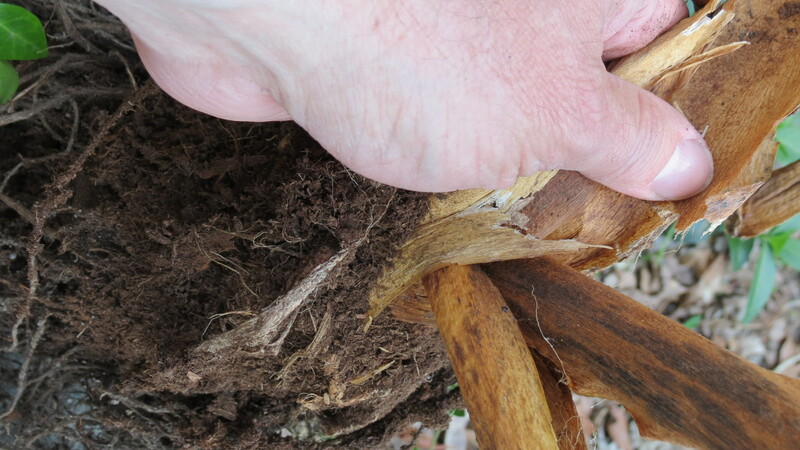 These I leave on – might as well give the bulbs a head start once they’re planted. 5. This Elephant Ear collection began years ago with the purchase of one bulb. Over time, smaller bulbs developed, like the one pictured here (toward the right), and these can eventually be separated, either manually or on their own. I’ve also learned that the bigger the bulb, the larger the leaf. 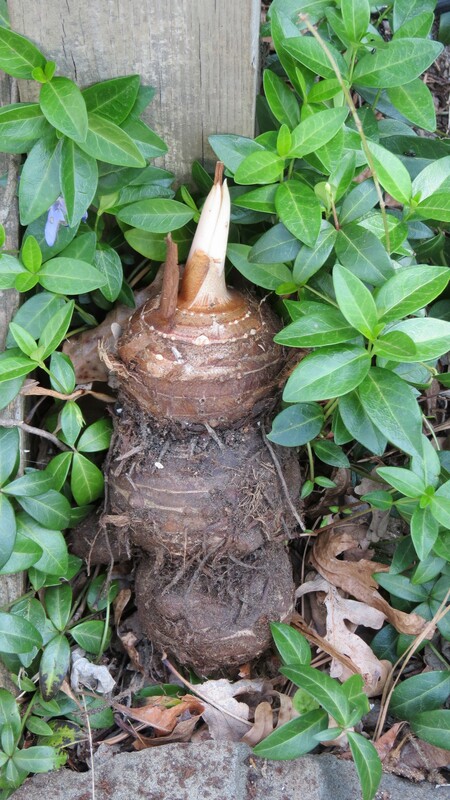 But the smaller bulbs also have value – they can be kept in pots and moved around the garden as filler. 6. To plant the bulbs, the toughest part is choosing the right sized pot. 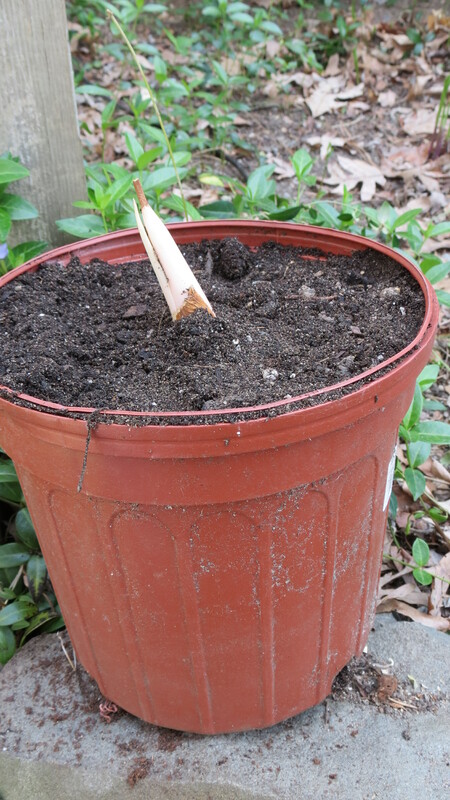 I add some potting soil to the pot, settle the bulb into place (shoot side facing up, of course), and then fill until the crown is just below the surface. 7. I’m sure I make more work for myself by first potting the Elephant Ear bulbs. With the pots, however, I feel I have more control over the plants. If there should be a frost, I can move the collection indoors. If a bulb fails to bloom, I won’t have an empty area in the garden. 8. Once planted, I place the pots in a sunny location and water daily. 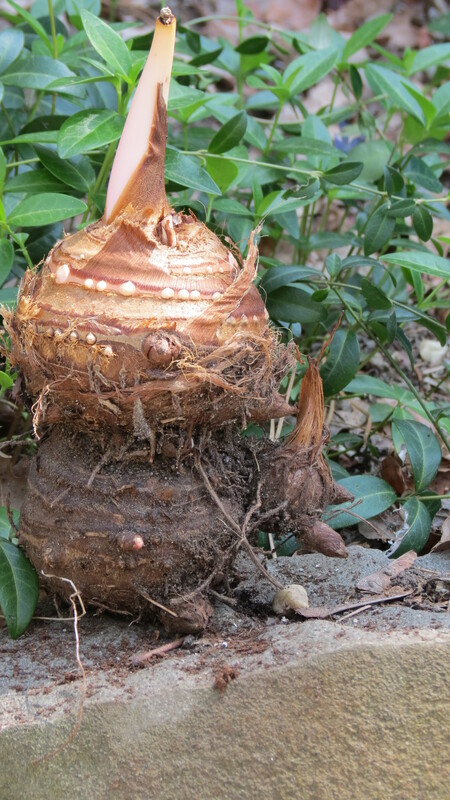 These are tropical, and they thrive on heat and moisture. Once they develop leaves, it’s into the garden they go – usually to a partial shade location. A special thank you to Elaine from Ramblings from Rosebank for suggesting that I post a few photos of Elephant Ears in their glory days of summer. Do you leave the old ones on the bottom? Hey Deirdre. I’m not sure what you mean, but I tend to go by feel. If the older area feels dry and lifeless and separates easily, off it comes. Normally, though, smaller bulbs grow from the mother bulb. When I unpack the bulbs in spring, these are naturally loose enough to separate on their own. I’ve never cut anything from the mother bulb. Actually, all of the elephant ears I have now (and the ones I’ve shared) have all come from a single bulb purchased years ago. They’re practically indestructible. Hope this answers your question. Yes, it does. I keep mine in pots all year rather than plant them. Hi Debra. I’m slacking when it comes to responding to comments this week. I wish I had a very exotic excuse, but I don’t. It’s work and catching up on things that just don’t fit into Saturday and Sunday. The elephant ears seem to be doing well — slow, but well. The days are nice and sunny — although we could use some rain — but the evenings are very chilly. Be well! Hi ‘Loba. Thank you for the nomination. I know there are a lot of rules with this award, so my acceptance may take some time. 🙂 I’ll let you know when it’s posted. I planted elephant ears last year and im not seeing any sign of them growing back. any advice? Hi Amanda. I think something should have sprouted by now — but I’m not sure where you live. 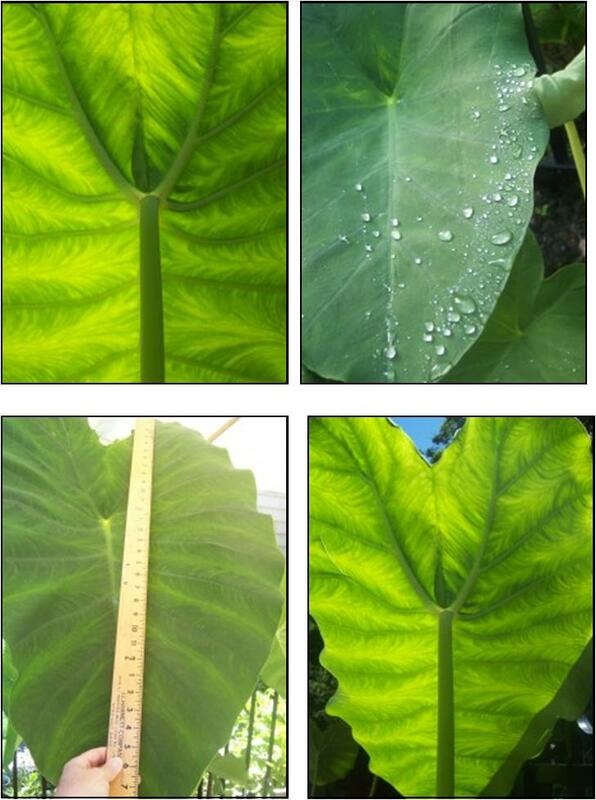 Elephant Ears are tropicals — they love heat and humidity (zone 8 and higher). If you live in any colder zone, the plants just can’t survive. That’s why I usually dig mine up, overwinter them indoors, and then replant in the spring. I have a friend who keeps his in a pot. He then carries the pot inside for the winter, lets the plant go dormant (but not letting it dry out), and then brings the whole thing outside again. This works for him. Hope this helps. I live in Missouri. I never thought to dig them up. is there any way to salvage them or should I buy new and start over? 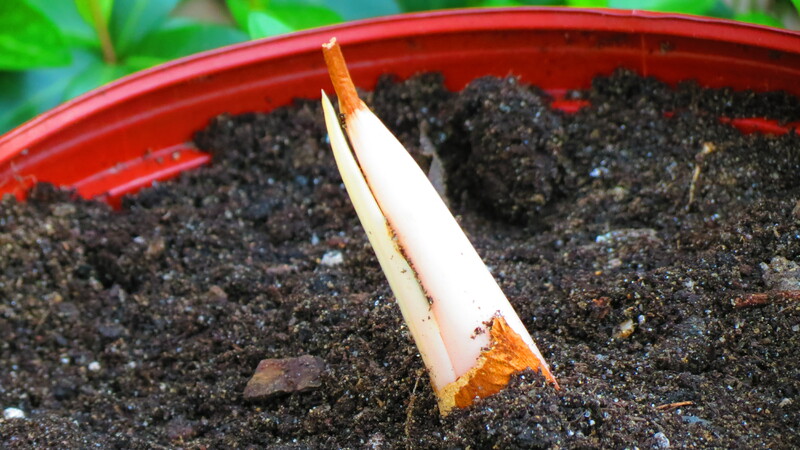 Pingback: How To Grow Ginger (Adrak) In A Pot In 8 Easy Steps! Thanks for the mention — but the photo you’ve used in your post is an elephant ear, not ginger.